‘Expressions of Accra – The Threads of Time’ is a fashion show that seeks to, through the use of local fabric and prints, tell the story of Accra in its past, its present and even venture into the future. The Threads of Time: The hands of Time are forever moving towards an indistinct future, in the process, pushing lives and societies into states of evolution and recurrent change. The alive and bustling city of Accra is not exempt to this evolution. In the swift passage of time and events, there is one important medium that captures it all: Fashion. Fashion is, arguably, the most expressive medium of a people’s past, present and future. Fashion encapsulates the totality of human life. It captures most accurately all moods of the times. Expressions of Accra (The Threads of Time) stands out from all other fashion shows in that it goes beyond the runway, taking its audience on a journey into a rich past to forge ways into an obscure future. It would capitalize on artistic expression of various forms to ensure that the audience is placed in a time capsule, an environment quite stimulating to the senses: Paintings, music, stage design and artwork, spoken word, and so much more. Expressions of Accra is a wholesome package of fashion, not for commerciality, but as a powerful fusion of history and art. Capitalizing on exploring young talent and expression, with an inclusion of seasoned designers, designers scheduled to grace the runway are Jacqui Johnson Couture Solutions, AfroModTrends, Msimps, Aya Morrisson, Kabengo, Sa4a, Elikem The Tailor, Fanny Ann Clothing, BATH Industries, DS Clothing, Karlren and Ashnorr. 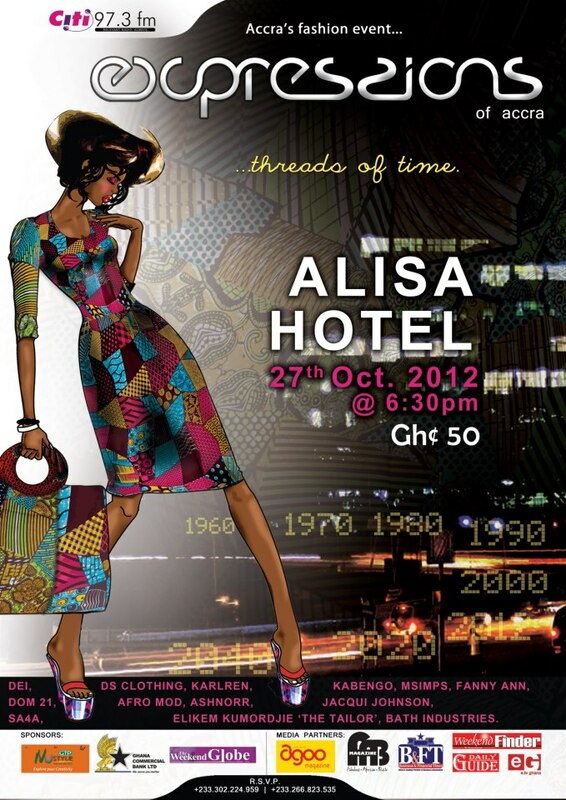 Tickets would be sold at GHC 50.00. Call 0266823535 for reservations. This program is supported by GTP NuSTyle, Ghana Commercial Bank, and The Weekend Globe. Media Partners are etv, B&FT, Weekend Finder, Agoo Magazine, Fab Magazine and Daily Guide. All proceeds from the show would be used to support the Citi FM Foundation as it puts up a Skills and Training Centre for over a hundred orphans in Trotor, a village near Suhum.